The Portland residents first settled in Kansas and wisely (like my wife) left for a better life in Oregon. Volga Germans were close knit both in Russia and Portland, creating their own neighborhood centered along MLK and left behind churches strung along N. Rodney and 8th. Farmers in Russia, they kept livestock in their large lots and found work in the Albina sawmills and railyards. Civic life centered around their churches. After two World Wars, Volga Germans began to distance themselves from their heritage and drifted away from “Little Russia” for suburbs and farms east of the cascades. Church going population declined. The churches and shops they left behind were occupied by residents of the black community driven from their homes by the City for construction of Memorial Coliseum, the Blanchard Block, and I-5. The last German congregation appears to have left the area in the 1970’s. This is a very brief summary of Eliot’s German heritage. More can be found at volgagermans.net and from the Volga German studies program at Concordia University. 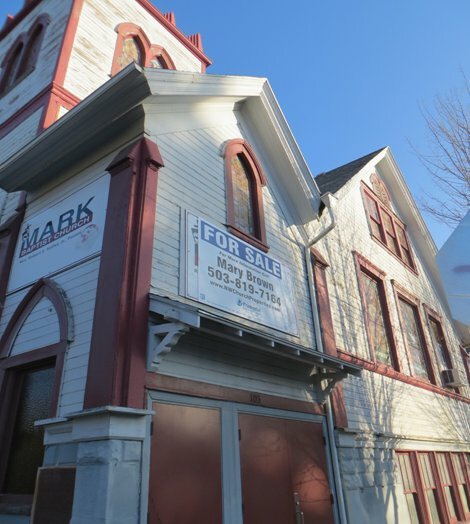 Although these early Eliot residents left their churches as evidence of their presence, much of it has been buried by subsequent occupants and a rewrite of history that favors more recent Eliot residents. Worse, the histories of both populations are about to be lost as their unique institutions (such as the Cox and Cox funeral home – well parking lot anyway, and Morningstar church) fall to in-fill housing with no acknowledgement of what they replace. Previous PostBoard Meeting Agenda for 2013-2-11Next PostIs it time to reconsider our school names? Thank you for sharing this lovely story of your home’s history and your community’s history. Is there any effort to have Portland update it’s local landmark designation list to enable the inclusion of the treasures you mention? What? Offend the developers who are only working for urban improvement. Why look! See the local heritage architectural elements they’ve added to the barns they’ve erected to the lot lines.